Little boys are made of snails and puppy dog tails, but girls are made of sugar spice and everything nice. Really? While all little kids have the ability to be sweet and adorable, there are some huge differences between how boys and girls learn and behave. Little Man and Little Miss are teaching me just how different the two can be. The most astonishing difference is the amount of talking they do. Little Man isn't really a talker. He is a doer. He is CONSTANTLY doing. One minute he is playing with LEGOs; the next he's climbing on the couch and "flying". Are boys always so different from girls? No, there are exceptions. Reading Raising Boys by Design has helped me understand the different thinking processes of boys (and men). Boy & Girl Brains are Wired Different. As moms, you probably know exactly what I'm talking about. If not, here's an example: while discussing what seeds we are going to start for our garden this year, I turn to Maverick and tell him about an important event coming up. The two thoughts don't appear to be related, but in my mind, there's a connection. In men and boys, their brains function mostly in the grey matter areas. What this means is that they tend to do and think about one subject at a time. There's little bouncing back and forth between random subjects. I can see the difference in thinking process by observing Little Man and Little Miss play. Little Miss is happily playing with her dolls till she hears me say something about food. Her mind will quickly change from play time to eating time. What Dr. Jantz means is your son isn't always ignoring you. When he is intently focused on completing a task, the parts of his brain that aren't being used take a break. They go to sleep. You may be calling him to come set the table, but his brain is still focused on that one task. It may take a few loud reminders to get his attention. Most boys love to watch movies where the bad guy gets defeated by the good guy. Teenage Mutant Ninja Turtles, G.I. Joe, Emoji, and The LEGO Movie are just a few examples. Before you get all non-violent on me, let me explain what is going on. In movies, the hero finds a cause. Batman's cause is to save Gothom City. That cause drives the hero to build his character and inner strength. 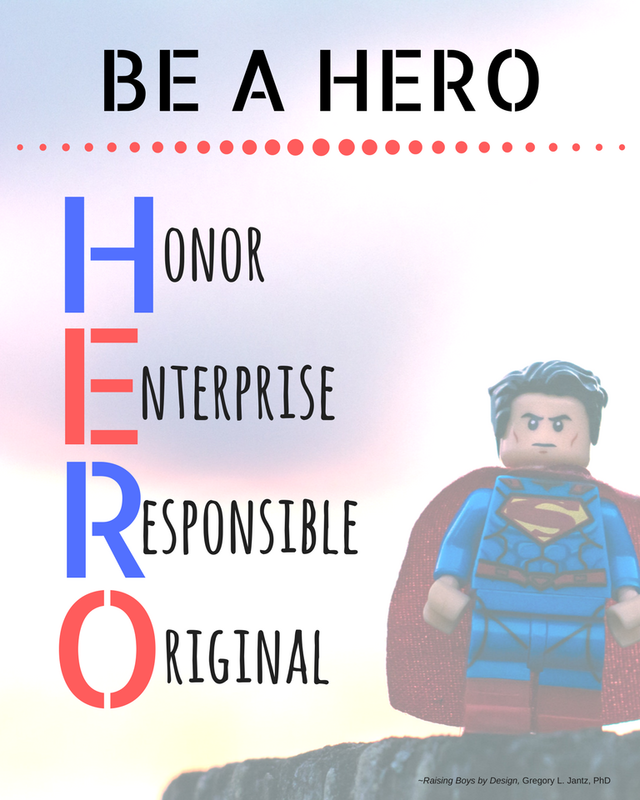 Overcoming their own personal flaws, the hero is able to defeat the bad guys and save the day. Take for example David fighting Goliath. When David heard Goliath's cursing, he knew what needed done to save his people. King Saul offered him a mighty sword and strong armor, but those things didn't fit David. David had to overcome his flaws and face the terrible giant with his trusty sling. He won. The good guy triumphed. There's more to being a hero than just winning a fight, and I love how Dr. Jantz defines it. This is such a great acronym. Boys have a natural desire to hero-ship. They strive to be and develop each and every one of these traits. It's our job as parents to help them push the boundaries of boyhood and instill the character of manhood. There are people out in the world that don't understand this fact. No one group of people is better than another. That's it. It's a simple fact. That is the whole point of abolishing slavery, ending the holocaust, and establishing women's rights. To place one group above another is wrong. When God created mankind, He created Male and Female with equal rights. Well, from the government's point of view, we already budget for boys and men- in our prison budgets. What? You mean to tell us that our government sees no hope of a future in our sons? No potential for greatness because of gender? To be honest, I cried after reading this. I looked up at my Little Man and had the same thoughts many of you do. "My son is just as unique and special as my daughter." The sad truth behind this society's warped thinking is that by hindering the development of boys they are also harming girls. People are the ones pitting men verses women. That's not what God intended. He made them equal and complimentary. Being a parent is tough. Not only are you responsible for the way you act, but now you are also responsible for teaching a small human how to act appropriately. When Little Man was born, I was so excited and very, VERY nervous. I had no idea what to do with a boy. Growing up it was just my parents, my sister, and me. That's it. No boys. There is still a lot of work ahead for Maverick and I as we nurture our Littles, but I'm so thankful for Raising Boys by Design. 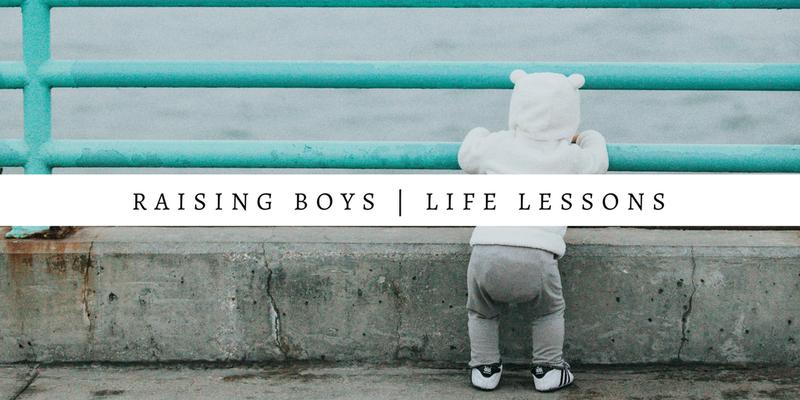 It has helped me understand better exactly what boys need to thrive. If there are boys and young men in your life, I highly recommend picking up a copy of this book →Raising Boys by Design. It's a great companion and guide to teaching boys to grow into men. Don't forget to have a pen and journal handy. There is just so much packed into this book- you'll want somewhere to collect all your thoughts. Like these. It takes a village to raise a child. Dr. Gregory L. Jantz really explains how import role models are to boys. His book challenges you to rise up to the challenge of bringing up a cute ball of energy and watching him bloom into a gentleman. *I was given this book in exchange for an honest opinion. yes raising boys can be tough. always to not compare to others. Sounds like a great book. I'm a girl mom, but it sounds like a good read, regardless! Thanks for sharing. This book looks great, I'll have to read it! I have a boy and two girls, and there is a definite difference in how they handle things. It is very interesting! I think it is so important to foster growth and development in both genders. I love the hero acronym. I'm going to remember that for my sweet boy! Love this post. I have two little boys and I hate all the bias towards girls these days. It seems like because my children are white and male, they will have to prove their worth in this world but it will still probably go unnoticed. I am a girl mom, but my daughter is always playing with her little cousins (boys) and I definitely see a difference in the way they play and think. This sounds like a good book, thanks for sharing! 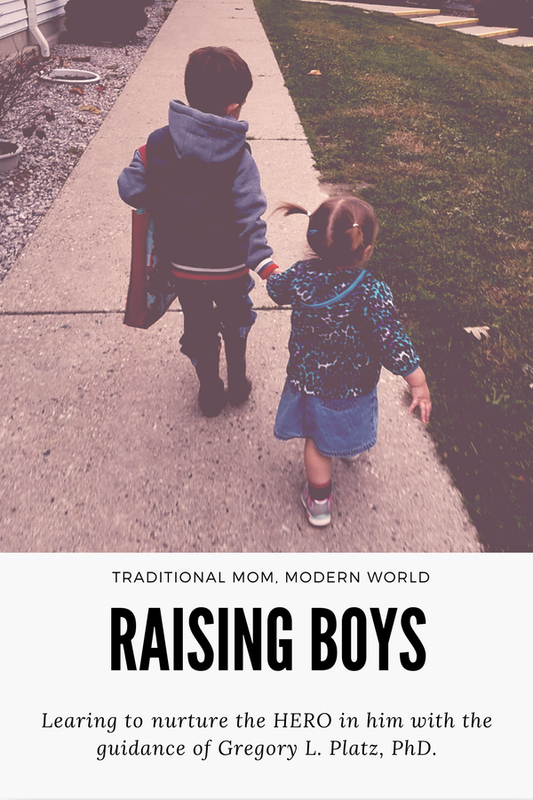 This is a great read for all the boy moms out there! As a boy mom, I often see empowerment and encouragement for girls way too often than for boys. It's not equal! As a girl mom, I find the part about how male and female brains are wired differently to be very interesting. I'm also all for the empowerment of kids in general. I think that we see so much aimed at empowering girls right now because it's not something anyone paid attention to before. Boys see lots of men in positions of power, whereas girls don't see as many women in those same positions. I think that's why there are more empowerment programs aimed at girls. I'm a father of 4 girls and one boy. I see right away the differences between the genders. I see too often in society the pendulum swinging too far trying to compensate for a past wrong. Correcting a wrong only truly works when you makes changes on the local level and not on the policy level. Too many think that governments were created to be the arbitors of justice between sexes and identities. Then you have the media gobble it up and applaud the policy makers efforts. When in truth the media only need to highlight the issue and on the street level people will almost always make the change. It is hard to do obviously when there is so much hand wringing and a lot less common sense. My son will grow with an appreciation for women obviously but he will also not be denied his own biological wiring. He should be a hero, he should celebrate his masculinity, he should desire to do great things and he should see the benefit of being a gentleman. Great article and I will give that book a read!